This site does not collect or store any information from its visitors. 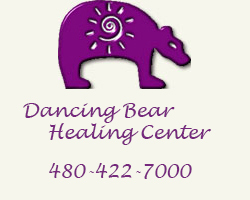 Dancing Bear® is a Registered Trademark with the US Federal Government and may not be used for any purpose without the specific written permissions of DBHC. Acutonics® is a registered trademark of the Kairos Institute of Sound Healing, LLC. The Original Bach Flower Essences® - is a registered trademark of Bach Flower Essences. Biomodulator and Transducer® are registered trademarks of Senergy Medical Group. Programmable Microcurrent Stimulator® is a registered trademark of InspirStar.